The fascination for collecting Australia-shaped items started almost a decade ago when I first began noticing just how many logos existed which incorporated the Australian map. Before I knew it the collection quickly grew from 10, to 20, to 50, to the literal hundreds I have today (and growing). Late 2010 I decided to launch shapingaustralia.com and publish the collection. I am intrigued by how the geographical shape of Australia has become somewhat of a default option when promoting products and services as 'Australian'. No other nation in the world seems to use their map to the same extent and regularity that we do. 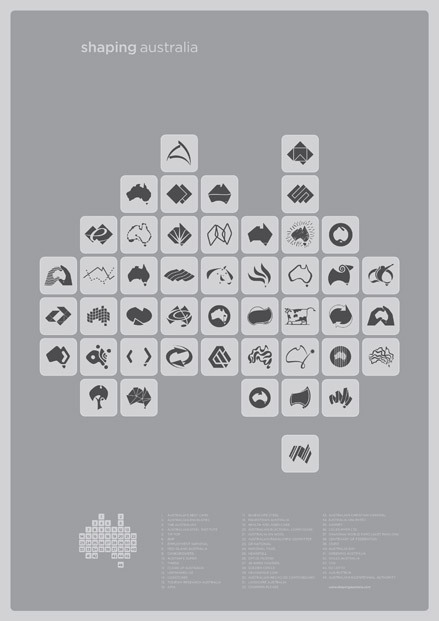 This makes it unique and begs the question – "Is our map as much an Australian icon as the Kangaroo, Opera House or Ayers Rock?" Queensland born and bred, Troy lives on the Gold Coast where he lectures at CATC's Gold Coast campus and works as a freelance graphic designer. Troy graduated with a BVA in Graphic Design from the Queensland College of Art, Griffith University in 1997. Besides client work, Troy is currently developing several self-initiated design projects including a type-based clothing label, Gaffertype.